PONSSE forestry vehicles are manufactured near the company’s place of origin in Vieremä, North Savo. After its founding in 1970, the 300-square-metre factory produced just two machines in a year. Today, the factory area spans four hectares and rolls out an average of five forestry vehicles each day. Even as Ponsse’s production volumes have grown over the years, the main objective remains unchanged. This objective is to manufacture the best forestry vehicles in the world in Vieremä. This goal is attainable only in an advanced production environment, where highly customised products can be manufactured under the principles of mass production. The manufacturing challenges faced by Ponsse are illustrated by the fact that there are some 30 product families in production, each of which consist of 80 features that are customisable depending on the client’s needs. The modular structure of PONSSE forestry vehicles is made possible by various digital solutions employed in both manufacturing and R&D. Still, digitalisation alone is not the solution to better manufacturing. Digital solutions are a means to an end to provide the company with competitive edge. If the company’s focus strays from its core business functions, digital solutions become simply another drain on resources. Ponsse is currently in the process of deploying an expansion of 1.3 hectares for the factory. Once online, both the assembly line and warehouse operations will take a leap forward in terms of procedures and the use of digitalisation. Thanks to optimised warehouse logistics, parts for the assembly line are made available with pinpoint accuracy to minimise the needed storage time. Production can progress smoothly as the necessary parts for each model of machinery are made available to technicians on time. At Ponsse, one of the clearest advantages of digitalisation has been in the cooperation with our network of partners. No manufacturer stands independent from others companies, and production must always be developed in tandem with the production network. 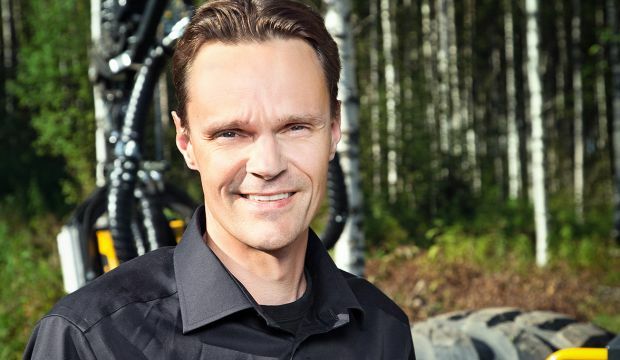 Although the share of self-sufficiency in production is exceptionally high in the case of Ponsse, from the perspective of the finished end product, self-production is merely one factor among many external partners. Through digitalisation, the complex puzzle of self-produced and outsourced components, modular product structures and logistics can be pieced together. The manufacture of forestry vehicles is a specialised field, with no ready-made solutions available. Companies in the industry must trust their vision and team up with the most suitable partners. The utilisation of digitalisation requires not only the ability to think outside the box, but the courage to take risks and step into the unknown. Not all experiments succeed, but without trying, progress would be slow or nonexistent. If the goal is to improve productivity, safety, quality and flexibility, new ways of thinking and working must be raised alongside conventional solutions. We strive to actively lower the threshold for experiments and tests on digitalisation solutions by carrying out suitably proportioned and easily implementable pilot studies in specific parts of the supply chain. Sometimes, the best practices are discovered through trial and error. Though we have by no means made use of all possibilities afforded by digitalisation in our production, progress is made one step at a time. Even the best practices need to be tested in daily routines with patience, and modes of operation based on digitalisation can only take root if they truly improve the efficiency and quality of work. This is visible as better end products and sharper competitive edge. In the near future, the greatest benefits of digitalisation will be related to the improved transparency and predictability of supply chain processes. In the current market trend, the need for this is highlighted by increased challenges in the availability of materials and components. Another area that shows promise is the inclusion of smart components in our products. We challenge our partners and suppliers to develop their products to be smarter than ever. For example, the hydraulic motors used in PONSSE forestry vehicles can share information on their condition and expected service life. Such information can be utilised fairly directly in tasks such as maintenance optimisation and logistics control. In order to extract the most gains from digitalisation solutions, all parties involved must possess the ability and will to develop operations and systems in close cooperation with others, including competitors. The various systems must be able to communicate seamlessly with each other. There still remains much work to be done in creating functional connections and standardised interfaces between the systems and products of different operators and rules on the ownership of raw and analysed data. The history of Ponsse is a series of bold decisions, without which the family-owned Finnish company from the heart of Savo could not have risen to be an exporter of cutting-edge technology for the needs of forestry industries in 45 countries. The new factory expansion is the largest investment in the company’s history. In Vieremä, the world’s most modern forestry vehicle factory is hard at work.